Gresham, OR – Set in the shadow of the towering Eiger, the Lauberhorn downhill vaults perilously through undulating Swiss cow pastures for over two miles. Its broad, sweeping turns through the upper snowfields belie the steep pitches to come. As you hit the Hanneggschuss – already nearly two minutes into the course – your legs are burning with fire and pain. Speeds hit 80 mph. And you still have 30 seconds to ski! The downhill in Wengen, Switzerland is a course for the great champions of sport. The legendary Buddy Werner won the combined in 1958. Daron Rahlves and Bode Miller paired up for three straight wins from 2006-08. Kyle Rasmussen won in 1995. 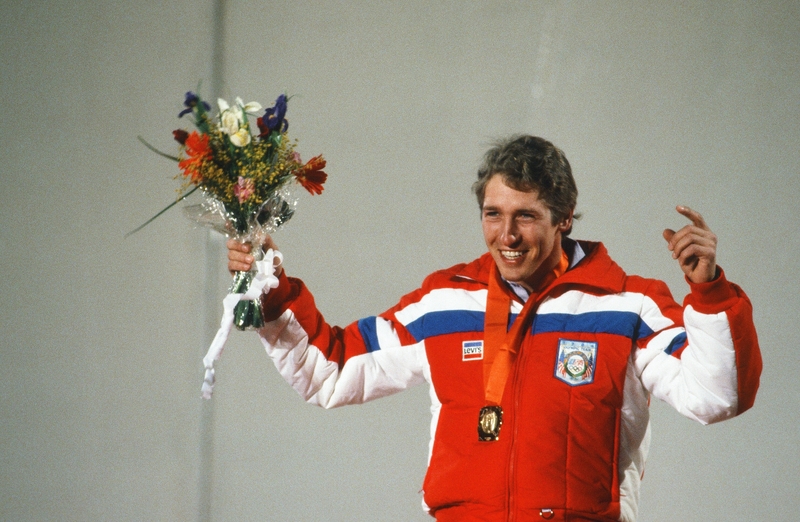 The passing of Olympic champion Bill Johnson last week brought back poignant memories of that special day – January 15, 1984 – when American downhill ski racing captured the world’s eye. Johnson came into that Olympic season with a singular focus. While he became a Lauberhorn champion, to him the win was only a conduit to a ticket to Sarajevo. In the lowered downhill start gate just above the Hundschopf, Atomic skis race technician Blake Lewis and Johnson bantered as his bib 21 start time drew near. 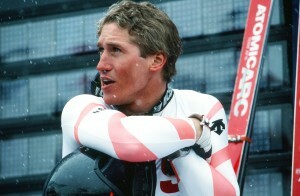 Lewis had become the first American ski tech to make it on the World Cup. His relationship with Atomic skis owner Alois Rohrmoser was a key piece of Johnson’s puzzle. Lewis had Atomic rocket ships in his quiver, and Johnson knew that. Earlier that week at a grocery store in Wengen, Lewis exchanged pleasantries with some fellow techs. They shared some points that got him to thinking about how he was prepping Bill’s skis – intel that would create a payday on race morning. At the start, Bill knew his plan of attack. He knew the race skis were fast. And he knew he could win. There was little fanfare as pushed out onto the course, dropping into the Hundschopf and down to the tricky Minschkante and through Canadian Corner. Interval times flashed the news – he was in the lead. The Europeans scoffed as Johnson entered the Langentrejen, expecting the American to come out of the untelevised blind spot behind in time. But his lead had grown. Time kept ticking by. Johnson’s legs were burning. Heading to the treacherous Hanneggschuss – now a minute, 47 seconds into his run – disaster struck. At speed greater than 70 mph, Johnson caught an edge. His skis splayed out. For a split second he was in grave danger. He quickly pulled his skis back on line but shot far off the course. U.S. Ski Team Alpine Director Bill Marolt looked up from the finish and joined a collective groan from the crowd not believing what they had just seen. Johnson was safe. But surely he had lost time and, more importantly, the speed he needed to get through Austrian Hole, through the S-Turns and down to the finish. He lost neither. Twenty three seconds later, he became the first American man to win a downhill since Buddy Werner’s Hahnenkamm title in 1959. Bill Johnson’s win that day in Wengen was historic. But it wasn’t the win that he savored, it was knowing he had punched his ticket to Sarajevo. Back at the Park Hotel – the setting for Robert Redford’s “Downhill Racer” 15 years earlier – there was no big celebration. After light congratulations, Head Coach Theo Nadig packed Johnson and others up for the drive to his home in Switzerland for a celebratory steak dinner. Johnson’s recent death triggered an outpouring of memories. He was a polarizing figure. But like him or not, he had earned respect. Time is the ultimate gauge of history. Now, 32 years since his storybook season, Bill Johnson has earned his place in history. In an ESPN E:60 documentary produced in 2013, Emmy-award winning commentator Jeremy Schaap asked Bill some simple questions. It was a time when Bill’s mind remained sharp, but he could only barely utter verbal responses. 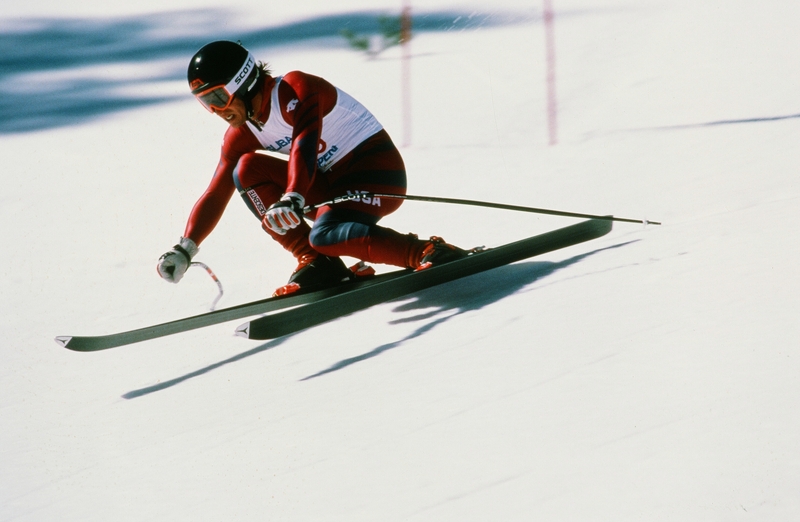 For decades, ski racing aficionados have had their opinions on Bill Johnson. But regardless of those thoughts, over three decades his legacy has grown. A decade after Johnson’s heroics, Tommy Moe won the Olympic downhill. A decade more and Daron Rahlves won the Hahnenkamm and Bode Miller earned a crystal globe. 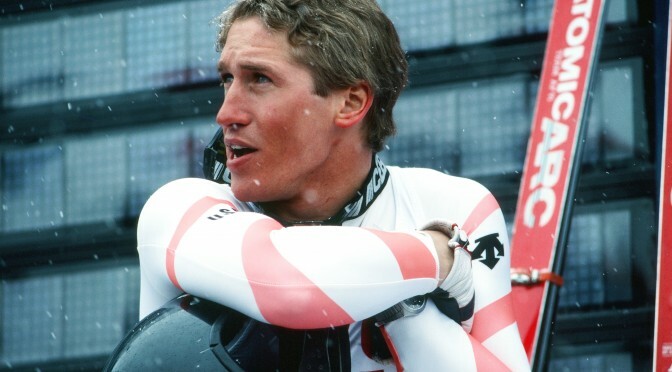 After his 2001 downhill accident, Johnson’s battle was to stay alive. His goal was to ski once again. Getting back on snow was the biggest battle of his life. But he did it. “The doctors told me no, but that’s too bad,” he said a decade ago. Bill Johnson’s life of just 55 years was packed with trauma and tragedy. But for eight magical weeks in 1984, he was king of the world. That sly grin on his face told the story of a young man who had achieved his dream.